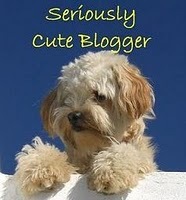 Thanks to Heather Hellmann for awarding me the Seriously Cute Blogger Award! Be sure to check out her blog Pen, Paper, Lots of Coffee. Book – Delirium by Lauren Oliver – I read this on vacation and enjoyed it. Look for a more comprehensive review soon as I’m woefully behind in my reviews for the Speculative Fiction Reading Challenge! Film – Harry Potter and the Deathly Hallows part 1 – Yep. I was one of those who went to the midnight showing. And I’m planning to do it again in two weeks. We already have our tickets for the Thursday night double feature with parts 1 & 2. Won’t dress up or anything – that’s a bit much for my tastes. TV – Burn Notice – I originally started watching this because of Bruce Campbell (of Evil Dead and Brisco County Jr fame) and stayed for the spy tricks and explosions. Also my husband’s favorite. Book – Linger by Maggie Stiefvater – Bought the paperback version just last week. After reading it, I’m not sure I’m going to be able to wait for the paperback release of Forever. Grr. Thanks again, Heather, for the award! Haha, I'm a manga purist xD I do love anime though. I just haven't watched it in too long b/c I think it's more time consuming than reading manga chapters. I can burn through those pretty quickly. Thanks, Lori. That's true about the manga, but the completist in me would need to do both. So I had to choose one or the other and since I started with the anime version… that's the one I'm sticking with so far! We're going to a midnight showing, too! This series has been a huge ivnestment of time and the final installment just feels like it deserves the midnight showing.